Bakiika (L) hands Magogo his nomination form. Courtesy. FOOTBALL. 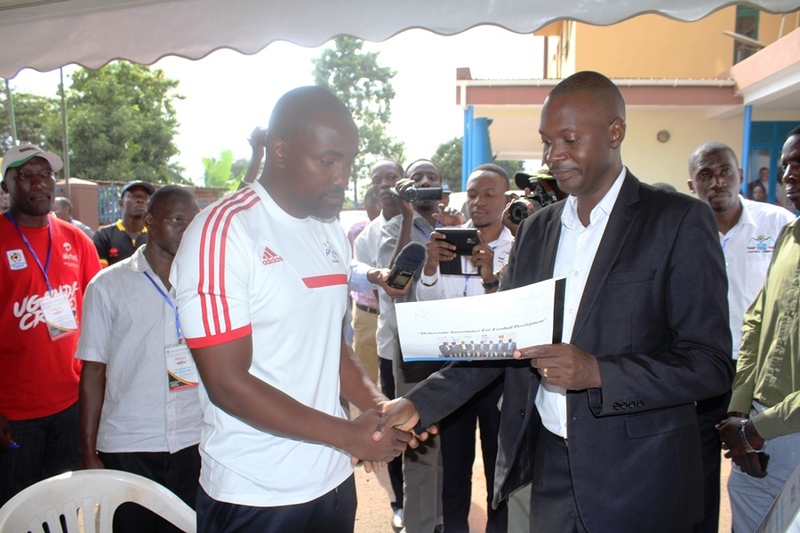 Proline director and head coach Mujib Kasule jumped into the Fufa presidential election fray yesterday officially picking nomination forms to challenge Eng. Moses Magogo’s pursuit for a second term in Fufa House. 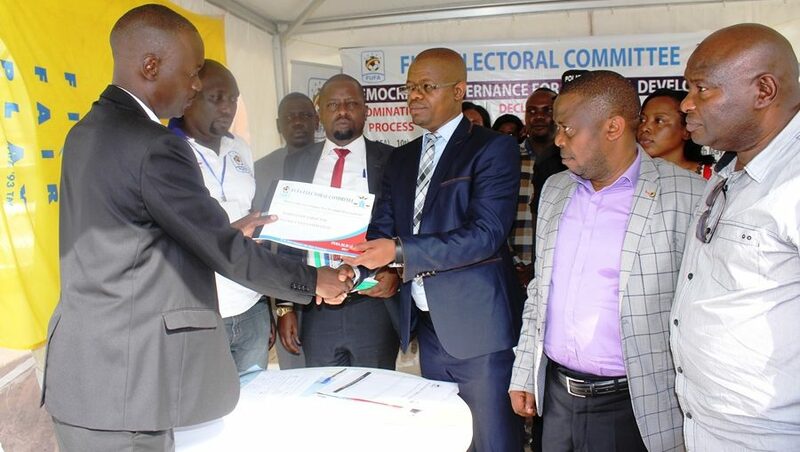 The incumbent and Kasule yesterday picked the nomination forms after fulfilling the payment process with the Fufa Electoral Commission and look set to be the two candidates to battle it out ahead of the August 5 election that will take place in Masindi District. A third hopeful, SC Villa’s Ben Misagga, did not return bankslips as a requirement for picking the nomination forms. Misagga had been heavily linked with the country’s football top executive job, but his no-show leaves the race open to Magogo and his erstwhile deputy. Sam Bakiika, the Fufa electoral commission chair, said Kasule booked Friday 2:30pm and Magogo at 4pm to return their nomination forms and be declared candidates if they full all the requirements. Eng. Moses Magogo, a Caf Executive Committee member, also chairs the Caf beach soccer and Futsal committees, positions he was elected to recently. Magogo’s quest for another term in office look a formality after delivering on the chalice that is Africa Cup of Nations qualifications, ending almost four decades of painful near misses and unfulfilled promises by his predecessors. Under his leadership, the local football organisation has seen a semblance of sanity, bar wrangles that saw DStv pullout of sponsorship of the local league after falling out with the Fufa. The local league has since revamped under Azam sponsorship and many clubs are looking stable. Bakiika hands Kasule his nomination form. Courtesy. Kasule is a former Fufa vice president in charge of the super league and technical, a position he resigned from three years ago because his team (Proline) had been relegated to the Big league. The former KCCA FC and Uganda Cranes player comes into the race to try to upstage the incumbent for a four-year term in office. A Kasule victory would be one of the most biggest sporting event upsets in Uganda’s history.